Sun, Dec 3, 2017, 11:18 am SL Time, ColomboPage News Desk, Sri Lanka. Dec 03, Colombo: Sri Lanka's Speaker of Parliament Karu Jayasuriya commending China's 'One Belt One Road' initiative said the modern day development project picks up on the historic relationship the two countries shared on the maritime silk road trading route. 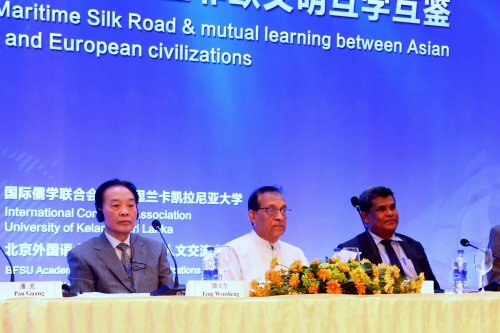 Jayasuriya was speaking at a seminar under the theme 'One Belt One Road' organized by the International Confucius Association and the University of Kelaniya under his patronage at the Taj Samudra hotel in Colombo on Friday. Speaker Karu Jayasuriya said the government of Sri Lanka highly values its friendship with China as the two countries mark 60 years of diplomatic relations strengthened by mutual respect for each other's sovereignty. The president of the Confucius Association gifted a calligraphy scroll to the Speaker as a token of friendship. Proposed by President Xi Jinping in 2013, the initiative is now in its fourth year and is of great importance to global governance and international endeavor to make globalization more inclusive. The belt and road initiative's development strategy to connect China to western markets by land and sea encompasses 65 countries including China, stretching through Southeast, South, Central and West Asia to the Middle East, Africa and East and Central Europe. Sri Lanka�s location in the Indian Ocean makes it a key point of interest for the initiative.